The Balanced Body Center performs disc decompression therapy administered by a licensed physical therapist. 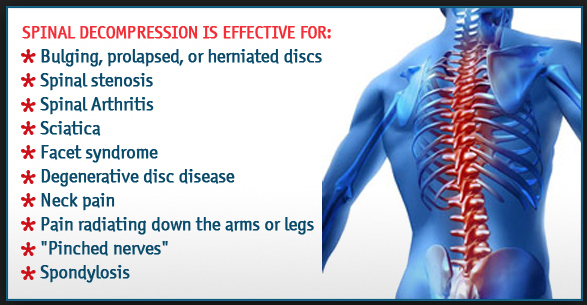 Decompression is used to treat a variety of cervical/lumber spine problems. It is a non-surgical rehabilitation program that uses FDA approved medical technology. Treatment consists of the use of a decompression table that gently stretches the soft tissue that attaches to the spine, thereby decompressing the intervertebral discs. This stretching and decompression happens on a microscopic level each visit, but over a 4-6 week period, the cumulative results become very dramatic.